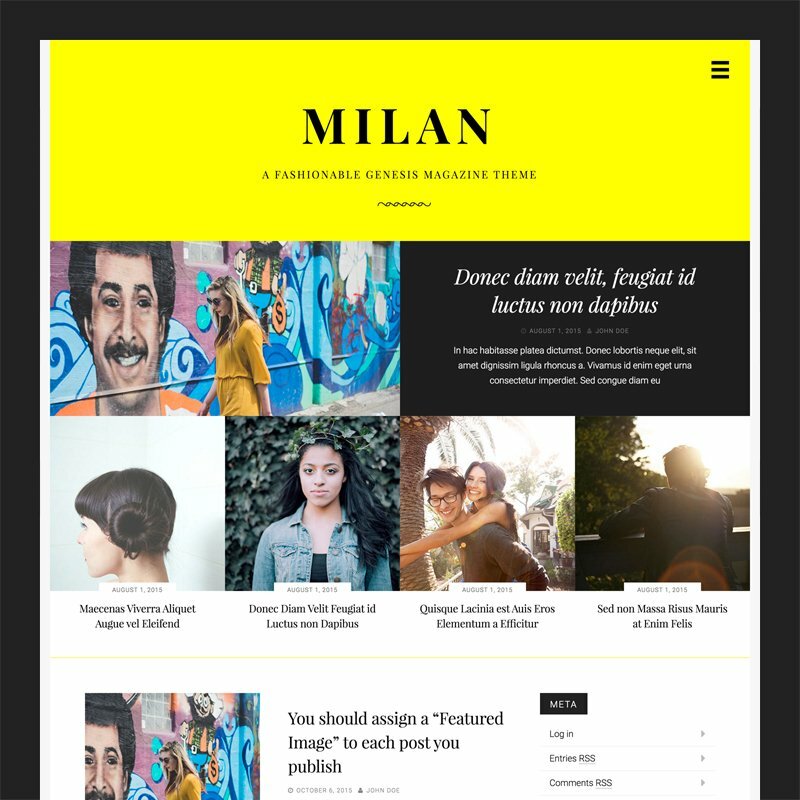 Milan Pro (the Genesis version of our Adaline theme that we sell on StudioPress) just got an update! This update adds Jetpack Featured Content functionality and fixes a Masonry bug that could be seen on archive pages with featured images (which they probably do). You can download it in your My StudioPress account area. In an attempt to make the Milan Pro theme more “Genesis friendly,” instead of using Jetpack Featured Content (like I did with Adaline) I set up a “Featured Content” widget area in its place, intended to house two “Genesis — Featured Posts” widgets. The first widget for the first featured post, and the second widget for the row of four featured posts below. Trying to use the Genesis Featured Posts widget in such an unusual way (as opposed to, just using it as a traditional sidebar widget as intended) would prove to be a mistake on my part. First, it was a pretty tedious process. Each of the two Genesis Featured Posts widgets needed to be configured with very specific settings. If even one setting was off, it could make the whole featured content section look off. Since this section is what gives Milan Pro such a distinctive look, this was a pretty big problem. This was the most common support request, and I didn’t have a very good response to it. 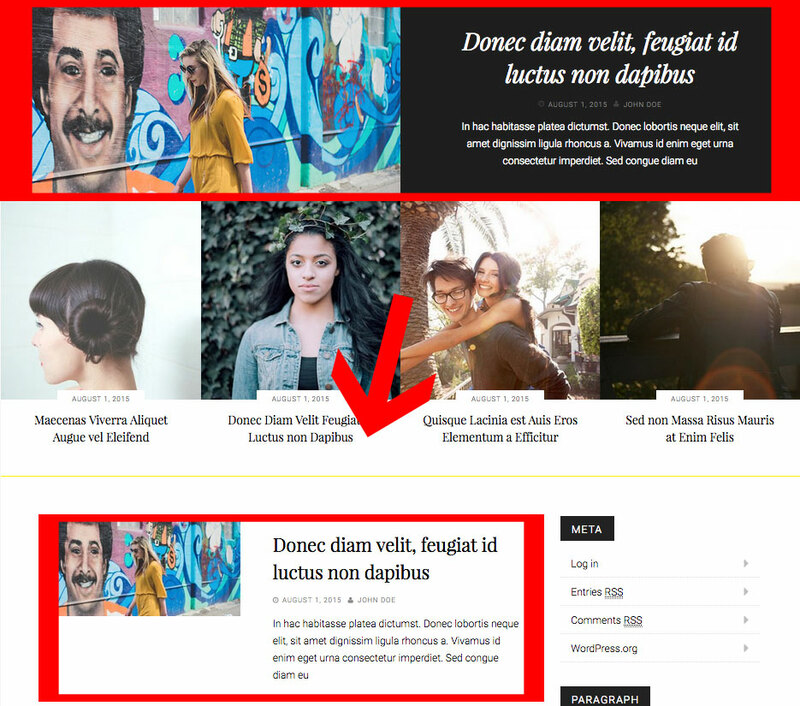 By default, featured posts in Milan Pro are repeated below in the main loop. Identify the category ID, then exclude it from the main loop in functions.php. 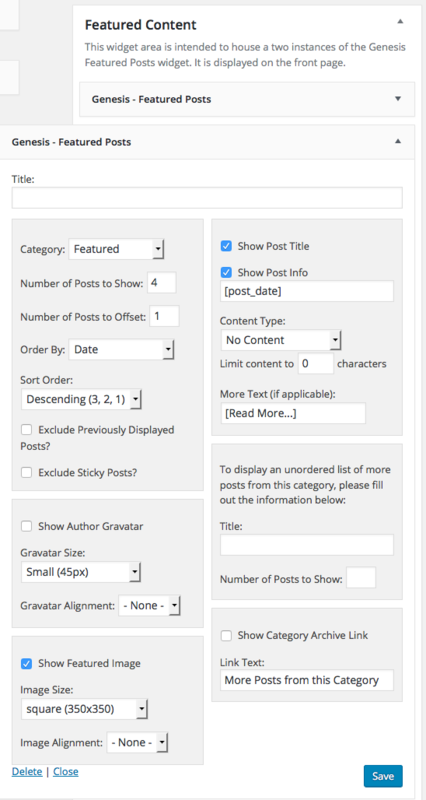 Use a plugin like Remove Posts in Category From Homepage to do the same thing. Adjust the date of the featured posts to be older than the first page of “main loop” posts, so they would not be immediately repeated below. None of the above solutions were ideal. The first two “category exclusion” techniques would require Milan Pro users to re-categorize posts outside of the featured category after five featured posts are published, otherwise older featured posts would be hidden from the main loop forever. The “date adjustment” technique could also be described as a “sweep under the rug” technique. The featured posts are still in the main loop, they’re just out of sight at first. 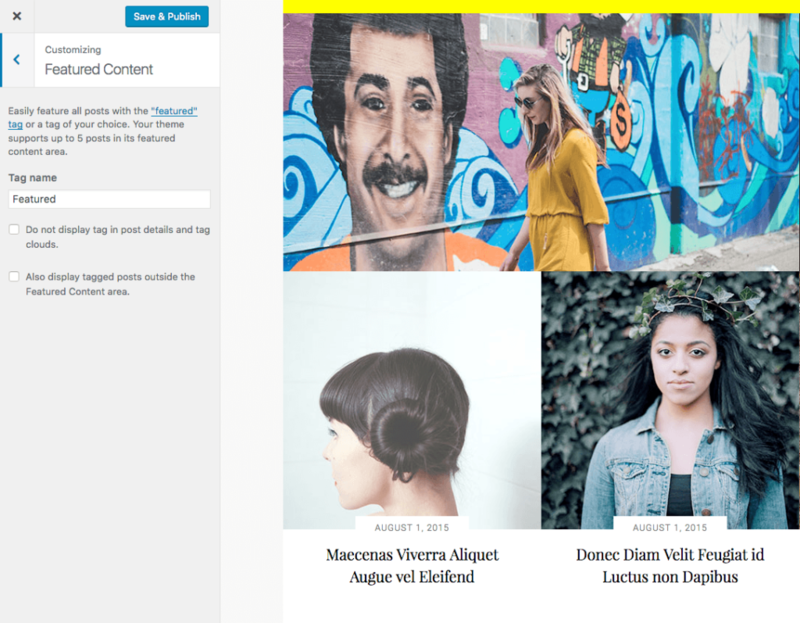 With Jetpack Featured Content, the latest five featured posts are automatically excluded from the main loop, and any featured posts older than that will seamlessly transition to the main loop. Every site I have ever seen using Milan Pro utilizes the featured content section. Like I said, it’s what gives Milan Pro such a distinctive look. Considering that, I wasn’t going to just rip out the existing Featured Content widget area setup, leaving anyone who updated an empty featured section. It’s important to note that any widget in the “Featured Content” widget area will prevent Jetpack Featured Content from showing up. This is how I make sure that Milan Pro users already using the “Featured Content” widget area do not experience an unexpected removal of their featured section. No need to “backup” your old Genesis Featured Posts widget settings. No need to re-categorize older featured posts to get them to show up in the main loop anymore. No more repeated posts. I bought this theme, and i cant figure out how to add a secondary menu (horizontal), right underneath the featured widget zone. Any help/hints on how to get this done? Thank you! This would require writing some extra code since the theme doesn’t support that out of the box. Are you using the Jetpack Featured Content? If so, it will probably be easiest to just output the menu at the very bottom of the template-parts/jetpack-featured.php file. If not, you’ll need to modify the milan_featured_content function in front-page.php. You’ll also need to familiarize yourself with wp_nav_menu if you’re not already. Still struggling to make JetPack work for me. I thought I had it for a moment, when I deleted the widgets from the Featured Content on my dashboard. But it appears I have a long way to go before I make this work, if ever. I am regretting my decision to buy Milan as my theme. Hopefully I can make sense of things soon, otherwise it will be a big waste of money as well as time. I’m so sorry to hear you’re having issues with Milan Pro. I don’t see any tickets from you in our support system but I will send an email to you shortly to get this sorted. Would you mind emailing our support about this? The support email is [email protected]. Does this problem happen with other themes? Does this problem happen with all plugins deactivated? As you can see on the Milan Pro demo site, it has no issues displaying content on pages, so the troubleshooting steps will be needed to discover the root of the problem. I see WooCommerce-related markup in there which seems to be taking over the page. How do I display pages as featured posts? Is that possible? Also, is there some option that I need to enable to show featured content on Archive pages? 2. There is no option for that at this time. The featured content is intended to only be displayed on the blog homepage, so this would also require some customization. I’m not sure if I should edit the Jetpack files. That’ll anyway be overwritten with the next update right?